let me share with you one of her recent recipe posts. I would love to have a go at making once I am back from my holiday. I love quiche, it is so simple and versatile to make and it can also be quite healthy depending on what ingredients you choose to use. 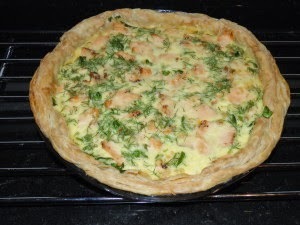 Salmon and Dill Quiche is great especially now that I am pregnant as it is full of omega 3 oils that are much needed for baby’s brain development, iron which is required for mummy and baby’s blood cell formation and calcium which is good for strong, healthy bone formation in baby and to prevent reduction in bone mass in mummy . To add to the ease of making this you can also use readymade pastry, great if you’re already feeling hungry before you start. 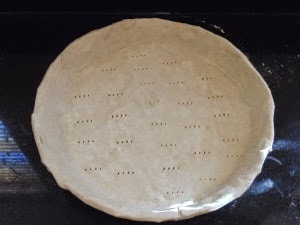 Roll out your pastry and line a dish that is approximately 26cm in diameter. Prick the pastry and then cover with baking paper and cover this with baking beans. Blind bake at 200 degrees in a normal oven or 180 degrees for a fan oven for about 15 minutes. Then remove the paper and beans and bake for a further 5 minutes by which time it should be golden. Trim the edges so it looks nice. Reduce the oven to 160 degrees / 140 degrees. Whilst the pastry is cooking combine the eggs, milk, cream and dill and mix well. Once the pastry comes out of the oven add in the watercress and smoked salmon and pour the egg mixture over the top taking care to make sure it has even amounts of dill all around. 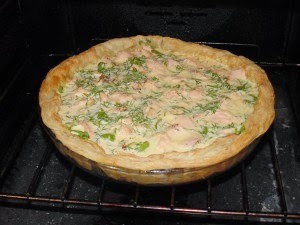 Place in the oven and cook for 30-40 minutes, keep an eye on the quiche to make sure you don’t burn it. You know it is ready when it wobbles a little in the middle only. You can serve the quiche warm or set aside and serve later (that’s if you can wait that long!). This goes well with salad so is a great healthy dish and don’t forget to use a nice big dollop of horseradish sauce, yum!